If you venture close to the water’s edge of a Welsh lake, beware the Afanc! A demonic lake monster of Welsh mythology, some versions of the tale describe the Afanc as a colossal beaver. Various folk tales place the beast in Conwy valley, where it was something of a nuisance to the locals. Stealing livestock and regularly flooding the surrounding land when it breached the surface of its watery home, it was unstoppable thanks to an impenetrably tough hide impervious to blade or spear. In a bid to rid the community of this scourge, the people of Conwy plotted to relocate the monster to Llyn Ffynnon Las, a lake in the shadow of Mount Snowdon. Strong iron chains were forged, the land’s strongest oxen were summoned and a beautiful but unfortunate local maiden was employed as live bait. The girl stood at the edge of the Afanc’s lake and called to him. As he approached she sang a Welsh lullaby and the beast, partial to pretty maidens, was lulled by her melodic voice into a deep slumber. Village folk rushed forward, bound the Afanc in the iron chains and hitched him to the oxen. The oxen struggled to Llyn Ffynnon Las (one exerting itself so much it lost an eye, its tears forming the lake Pwll Llygad yr Ych) and the monster was loosed into the lake, its sturdy banks confining him to his new home forevermore. Unlike the monstrous Afanc, the innocuous European Beaver (Castor fiber) is not only herbivorous, but studies show its activities—chiefly damming—are instrumental in flood prevention. 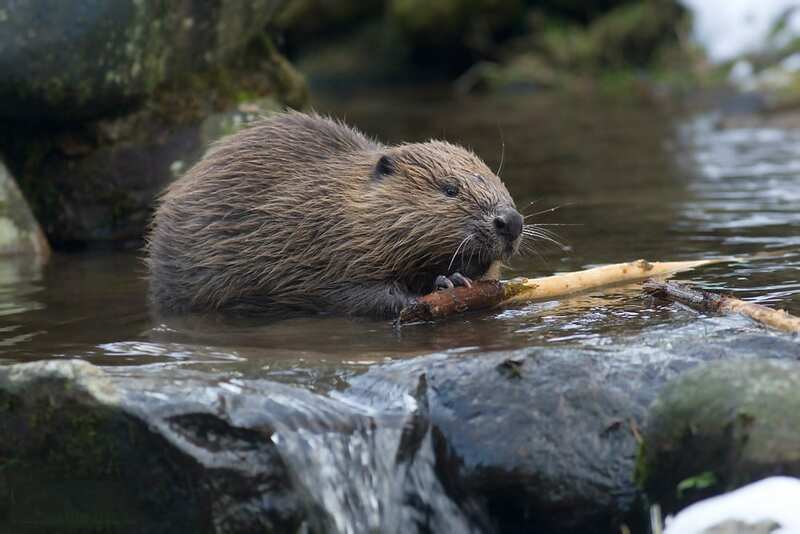 Recent trials in Devon and Scotland have seen beavers reintroduced and are monitoring their effects on flooding and other environmental factors. In Devon a small stream, previously with a water holding capacity of a few hundred litres, has been dammed to such great effect that it can now hold 65,000 litres. Damming systems trap sudden rainfall, evening water flow and preventing areas from becoming inundated. Both schemes report an increase in biodiversity and water condition, damming having boosted organic matter retention, aquatic plant biomass and species diversity whilst providing efficient natural filtering systems. Beaver activity promotes the self-purification of water, neutralises acidic run-off and creates pollutant sinks. Beavers create and maintain wetlands by increasing the water table levels in their locality. Wetlands are important yet fragile ecosystems, essential flood defences that absorb excess water during heavy rainfall, releasing it gradually. Beavers also create coppice in their tree-felling activities, providing habitats for plants and animals in woodland areas. Coppicing and wetlands require maintenance, a costly undertaking paid for by the public. Reintroducing beavers would aid the management of these areas, and to date no beaver has ever requested a wage. Beavers are a semi-aquatic key-stone species and are the second largest rodent in the world. Reddish-brown in colour, they are famed for their paddle like tails and large, webbed back feet. Valves in their nostrils and ears, and membranes protecting their eyes, allow them to stay underwater for up to fifteen minutes. Beavers generally mate for life and have a litter of kits every spring. Prized for their pelts, meat and scent glands, beavers were hunted into extinction in the UK between the 12-16ᵗʰ centuries. Belonging to our native landscape as surely as we do, reintroducing beavers would not only benefit our environment, but wildly enrich our experiences with nature.